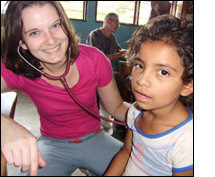 I was hoping that the trip to Honduras would open my eyes to the reality of medicine and to the potential I have to give back to communities as a physician. I don't think I could have been more "dead on" with respects to how the trip would change my perception about being a physician. For two short weeks, a group of 1st year medical students, nurses, pharmacists and physicians traveled deep into the Honduran mountains to a small area called Pinares. Because of the complexity of the needs of the people, we divided our group daily into either a "clinic" group or "Child Health Initiative" group. We were fortunate to have access to a clinic very near where we were staying. The clinic was a beautiful building, equipped with several exam rooms, a pharmacy and registration area. There we spent most of the day seeing patients ranging from small infants to elderly adults. While most patients were there for specific complaints, we were fortunate to also see some patients that routinely come to the clinic for chronic medical conditions, such as hypertension and diabetes. It was amazing to see that the clinic had become such a mainstay in the community that patients would hike hours up mountainous terrain in order to maintain continuity in their care. On our days on Child Health, we drove or hiked to local schools in order to provide dental care, visual exams, hemoglobin testing and healthcare to the children. For the physicians, our role was to provide de-worming medication, iron/vitamins and treat any acute medical conditions. The children were so grateful for our care and were thrilled to get a pencil or sticker at the end of the day for being so patient. Overall the trip was an amazing experience. I learned so much about myself as a physician and my ability to teach others. I now know that I hold the power to make a great difference in the lives of many people. Not just in my ability to deliver healthcare, but also as an advocate for my patients. I look forward to continuing to travel on trips like this and appreciate being given the opportunity to have done so.